1. Draw hydraulic fluid out of tank. 2. Press out tie rods with a standard extractor. 3. Pull back hose strap with harness after removal of screw on side. 4. Remove bolts from stabilizer mounts. Let stabilizer hang down. 5. 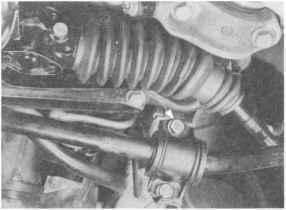 Unscrew pressure line and return line at steering gear. 6. Remove five bolts from reinforcement plate on 9. 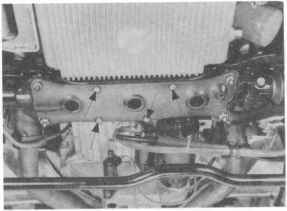 Now remove the four mounting nuts and take engine carrier. steering gear out of studs on engine carrier. 1. 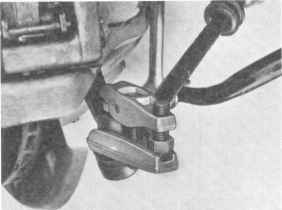 Slide universal joint on to steering gear in correct position (steering wheel and steering gear in center position). Nuts on steering should only be screwed on slightly (facilitates assembly). 2. 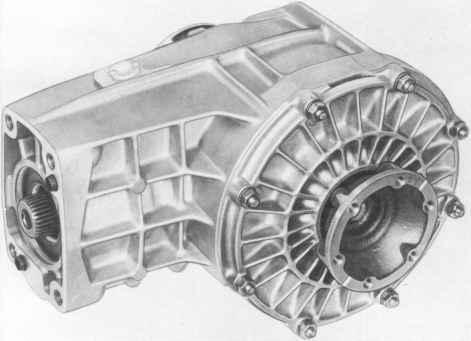 Mount steering gear. Produce 8 mm clearance between steering gear and universal joint with gauge 9208. Tighten mounting bolts for universal joint to 28 Nm. 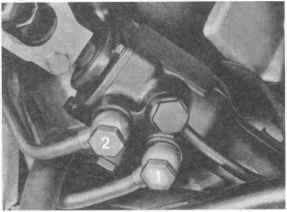 On cars with a longer universal joint the clerance will definitely be less than 8 mm after inserting clamping bolt on the steering gear. In this case it is important to make sure that there is only a small gap between the steering gear and universal joint. 7. 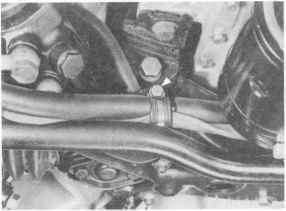 Loosen four self-locking nuts of steering gear, but do not remove them. 8. Remove bolts on universal joint. 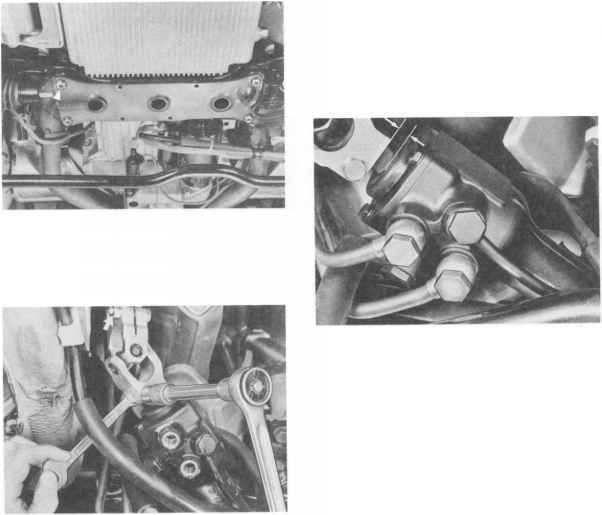 Push universal joint in direction of steering intermediate shaft. The steering stop has also been changed because of changes on the steering gear (rack deep-bore drilled and 15 mm longer, smaller diameter on ends of rack). Stop 928.347.329.03 is no longer available for replacements. See cross reference survey on page 48 - 6 b. - opening on one side with two surfaces in conjunction with spacer, Part No. The History of Porsche Cars through its generational changes. 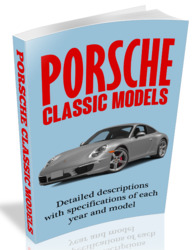 A must have ebook for any Porsche fanatic, this ebook is a reference book for Porsche enthusiasts. Discover all there is to know about the greatest Porsches ever made. All models are fully described and illustrated providing a definitive production history plus an accurate guide to original specs and equipment.